Just last week I met a woman whose husband was of German-Russian parentage and we had a brief discussion about how unusual that was, given the enmity that both sides might still harbour for WW2 atrocities. It reminded me of neighbours I once had, a Palestinian happily married to an Israeli. It takes a remarkable love to rise above political and cultural hostilities like that, but it’s also interesting to consider the circumstances in which such a couple might meet, how their initial reservations might be overcome, and how their ongoing relationship is negotiated in their community, whichever it might be. In The Wedding Shroud Elisabeth Storrs considered the introductory phase of such a relationship. The central character Caecilia is a Roman noblewoman who is used to barter peace through a diplomatic marriage with Vel Mastarma of the neighbouring Etruscans. In her absorbing first novel Storrs showed how the barriers between them eventually fell, though not without cost. 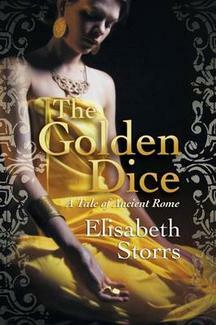 In this sequel, The Golden Dice, she dissects this relationship as the peace breaks down and Caecilia’s love for her husband is tested against her conflicted loyalty to Rome. Time and again I found myself thinking of Helen of Troy, a woman who also transgressed ideas about loyalty to kin and country for the sake of a man, and who must have engendered hostility in both her homeland and her adopted home. The setting for the story, Ancient Rome and Etruria, is an exotic choice for historical fiction, but the elements of the story are universal. Through the lives of three women, Caecilia the aristocrat, Semni the would-be artist, and Pinna, a whore seeking to transcend her lowly status, Storr fills her canvas with the complexities of human emotion: love, trust, and loyalty; hate, envy, and revenge. With each of the characters, male and female, she dissects contrasting values, using the cultural differences between Etruria and Rome to show the psychological torment of conflicting loyalties. One of the dilemmas faced by contemporary authors writing historical fiction is that the role of women was usually so circumscribed that authenticity is compromised if the desire to create strong female characters results in them behaving in ways that are anachronistic. In keeping with her historical period, Storrs is able to avoid this peril because there were fewer restrictions on women in Etruscan society, making it more appealing to Caecilia and easing her betrayal of Rome. She finds herself attracted to the Etruscans’ more flexible permissiveness, its lively colours and its music, though she also clings to her more dignified Roman persona and she is revolted by the darker side of its religious rituals. There are aspects of the more ordered traditions of Rome that she discreetly values, and occasionally her nostalgia for Roman decorum causes hostility in her new home. With her husband away at war she is vulnerable to hatred and suspicion as well as a conflicted heart. Occasionally – especially in the early chapters – the weight of Roman-Etruscan terminology gets in the way of smooth reading, and there were times when I had to consult the glossary at the back. But apart from occasional hurdles like ‘tufa walls’ (i.e. made of limestone) and the ‘aulos’ (a musical instrument) it doesn’t take long to absorb the new vocabulary, and the story gathers a compelling momentum. There was brutishness on both sides, and the veneer of civility and order relied on good leadership, a quality always at risk when there are men and women of ambition in the ring. Anger, revenge and ambition motivate Caecilia’s most powerful enemies, but it is a naïve religious fanatic in her own household who causes the greatest danger. The Golden Dice is a great sequel to The Wedding Shroud and I am hopeful that there will be more from this talented author. You can read more about the historical background and also some sample excerpts at Elisabeth Storrs’ website. A word about the publishing history of this novel. My review policy makes it very clear that I do not accept self-published books for review. It’s not just that I value my reading time too much to risk reading books which are poorly conceived and edited, it’s also that (having had some woeful experiences with self-published books) I value the work that editors do, and my stance is a way of asserting their importance and supporting their ongoing role in the publishing industry. However, I have made a one-off exception with this novel because Elisabeth is a previously published author of considerable merit and I had asked her to let me know when her sequel was published. As it happened, through no fault of her own, Elisabeth’s contract with the publisher of the sequel fell through, and so she decided to publish independently. However, what made me agree to read her book notwithstanding was her professional approach: she engaged on a freelance basis the editor from the original publisher so that I felt confident that the book had been through the rigorous process that professional editing provides. I very much appreciate your stance on not reviewing self-published books, Lisa. In the past I’ve been presented with some woefully produced self-published novels, which really brought home to me why it is called “vanity publishing” — though I think they call it “indie publishing” these days, a term which I hate. After being stung once, I refused to accept self-published books for review and state this very clearly on my blog. Yet earlier this year one self-published author took me to task in a series of rather rude emails — she only apologised when I pointed out I was an editor and that reviewing books that hadn’t been edited sent out the message that the role of my profession was pointless. Yes, I’ve had people be quite insistent with me too, and while I am sympathetic to the work they’ve put into their book, I won’t change my stance on this. They need to understand that I’m not under any obligation to review anybody’s book, much less one that hasn’t been through the process.